Russian gas giant Gazprom says Europe must build a new pipeline from Turkey if it wants to secure energy supplies via its new route that cuts out Ukraine. If Europe expects to receive gas supplies through Gazprom's new Turkish Stream pipeline, announced in December after the collapse of plans for a South Stream line through Bulgaria, it must build its own infrastructure by that year to guarantee continued supplies, the Gazprom chief told business daily Kommersant. "Gazprom has finally assumed a hard position, giving Europe an ultimatum," said Ivan Kapitonov, Deputy Head of the Department of State Regulation of the Economy at Moscow's Presidential Academy of National Economy and Public Administration. Now it was Gazprom's European partners who would carry the risks related to building a pipeline to ensure supplies. "We are witnessing the strengthening of Russia's negotiating position, which is supported by weighty arguments." "The Turkish Stream is the only route that can be used to supply 63 billion cubic metres of gas that are now transiting through Ukraine," said Miller. Europe should start building new pipelines "right now," otherwise, "these volumes of gas can wind up in other markets," the Gazprom boss warned. Russia had been intending to supply gas to Europe that bypassed Ukraine through South Stream, which was to have been built in Black Sea basin. The pipeline was designed to go through Bulgaria, Serbia, Hungary, Austria, Italy and Slovenia; even Macedonia demonstrated a desire to participate in the project. Last month Russia ditched the project and instead said it would build a new pipeline to Turkey, dubbing it the Turkish Stream. Officially the decision to cancel South Stream was blamed on Bulgaria, which due to inconsistencies associated with anti-monopoly rules in the European Union's Third Energy Package, froze the project in August 2014. The regulations state that owners of pipelines on EU territory cannot be gas-extracting companies. A new round of negotiations over gas supplies to Europe was held in Moscow on January 14 during a visit by Maroš Šefčovič, EU Commissioner for Energy Union and European Commission Vice-President. "I was very surprised by Gazprom's announcement," Šefčovič said after the meeting, but added the EC was willing to discuss Gazprom's new proposal. Ilya Balakirev, chief analyst at UFS IC, believes that many in the EU still cannot believe that South Stream has actually been abandoned. "For a while it seemed that it had just been a clever move, in order to 'raise the price' of South Stream, but the more time that passes, the more this 'shift' is starting to look like reality," he said. Refusing to allow gas supplies to transit via Ukraine is credible, regardless of which alternative project is realised, he added, since increased economic risks are aggravated by political considerations. "Not one of the existing alternatives to organising transit through Ukraine guarantees uninterrupted supplies to Europe," Balakirev said. Dmitry Baranov, a leading expert at Finam Management, said Gazprom has the right to determine its development strategy, including issues related to the transportation of gas. "This is exactly what Gazprom has done," says Baranov. "It has announced its need to change one of its traditional routes." In addition, the company was not refusing to supply gas to Europe and it would continue to meet its obligations. It just wanted to free itself of the services of a transit country, Ukraine. 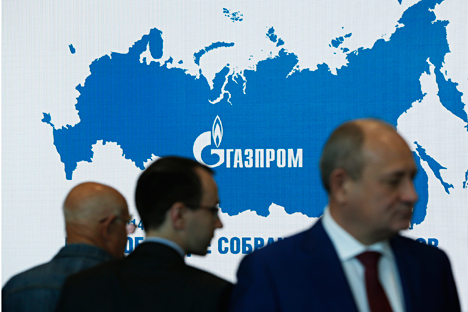 "Gazprom is suggesting Europe participate in solving the problem," Baranov added.